In 3 1/2- to 4-quart slow cooker, place onions and bell pepper. Cut beef brisket across grain into 3 large pieces. Place beef on top of vegetables in slow cooker, overlapping pieces to fit if necessary. In small bowl, mix barbecue sauce, chili sauce and garlic until blended. Pour over beef. Cover; cook on Low heat setting 10 to 11 hours. To serve, remove beef from slow cooker; place on cutting board. With 2 forks, pull beef into shreds. Return beef to slow cooker; stir to mix with sauce. 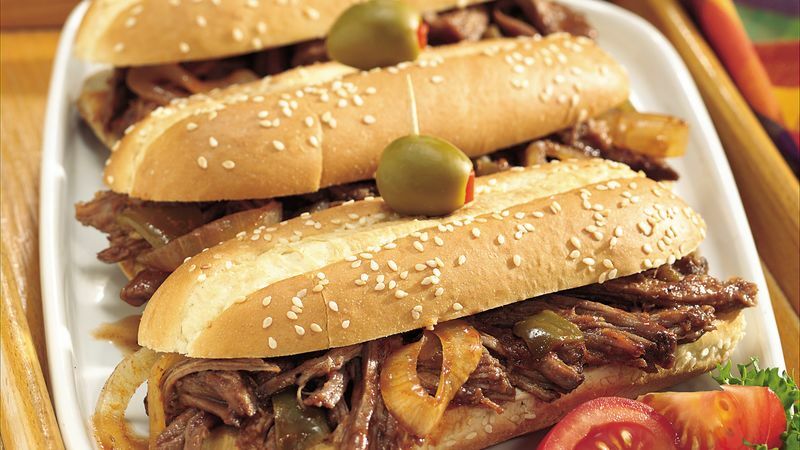 With slotted spoon, serve beef in hoagie buns. Garnish as desired. Brisket is cut from under the first five ribs of the breast section. The beef is sold in two sections, a lean, inexpensive flat cut and a richer point cut. This recipe works best with flat-cut brisket. Cut the shredded meat into smaller pieces and serve it on soft dinner rolls for perfect kid-sized sandwiches.